In 2014 and 2015 the Amsterdam Coffee Festival’s venue was the NSDM Werf in, you guessed it, Amsterdam. The venue then was much larger and the festival really only used part of it. This year the festival moved to the Westergasfabriek complex, using the Gashouder and the Transformatorhuis buildings. Both buildings are larger than the area reserved for the festival at the NSDM Werf. Even though overall there was more floor space there seemed to be less space to walk, in part due to the larger number of stands. The festival also attracted a lot more people, which was very noticeable on the events second day (Saturday) when both buildings were filled to the brim with people. The Amsterdam Coffee Festival is a great place to meet people with similar interests from all over the world. I personally met Barista Buddy, Dritan Alsela and saw James Hoffman taking his time explaining some concept to another visitor. Amsterdam Coffee Festival 2016 photos! SanRemo brought a few of their Opera espresso machines. The levers on top of the groups hint towards the traditional lever operated machines. On the Opera however, these are mostly cosmetic as all they do is operate a microswitch. 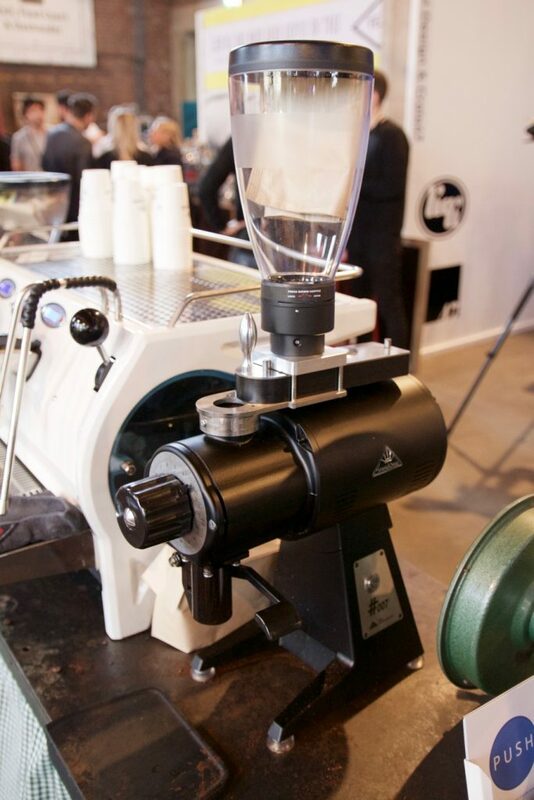 BFC had a small booth as well, showing off their Aviator espresso machine. This Faema E61 Legend was actually the first machine you’d see when walking into the Gashouder building. I’ve always had a soft spot for these machines and this beauty definitely caught my eye. This Victoria Arduino VA388 was one of the very few machines that weren’t actively in use. It wasn’t even powered on! Personally I like the black side panels much more than the traditional silver panels. Faema came to play this year, definitely one of the larger stands. The sheer number of E61 machines was amazing. These two were Anniversary editions, as a tribute to Faema’s 70th anniversary (1945 – 2015). This Slayer was apparently hiding, although there were a few people standing around that had recognized it as well. This single group slayer is much smaller than I could’ve imagined. Compak came to tell us their burrs were much bigger than ours. The burr all the way in the top of the picture is what most commercial grinders use, sized at 64mm. The rest… well, you do the math. 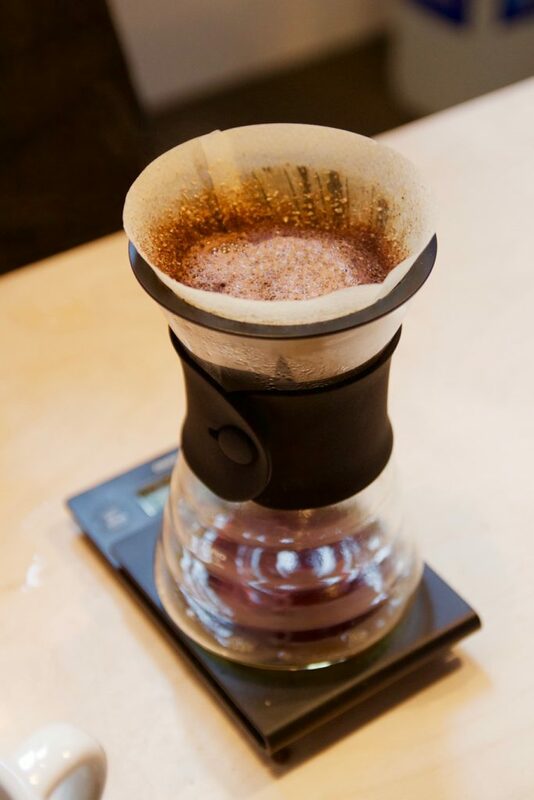 The guys from Bulldog Edition, a cafe in the ACE Hotel London prepared one of the two Square Mile coffees they brought along. Fun fact: if you’re thinking about going to the London Coffee Festival (April 7 – 10 2016), the ACE Hotel is right around the corner. These custom tampers are simply beautiful. diRossi makes custom tampers in a variety of different shapes using several types of exotic (and less exotic) woods with bases in any size you want. Finding the O.C.D. (Ona Coffee Distribution tool) for sale at the event was a complete surprise to me. Up until recently Ona Coffee completely sold out of their first batch. During the 3 days of the event La Marzocco organized a competition for whoever could pour the nicest latte art using one of the Linea Minis. The grand prize? A Linea Mini. I gave it a shot and was pleasantly surprised by the sheer steam power this tiny machine had. La Marzocco also brought Mod Bar along, which would be the first time there would be a Mod Bar machine in the Netherlands. Sadly this year Kees van der Westen decided not to join the party. Illy however had most of KvdW’s lineup on their stand. Plus some pretty good coffee to boot! Compared to last year there seemed to be fewer Mahlkönig EK43’s around, but the ones that did make it all seemed to have this device on top of it. It is a volumetric dosing tool made by Titus Grinding. A personal favorite of mine, the La Marzocco GS/3. 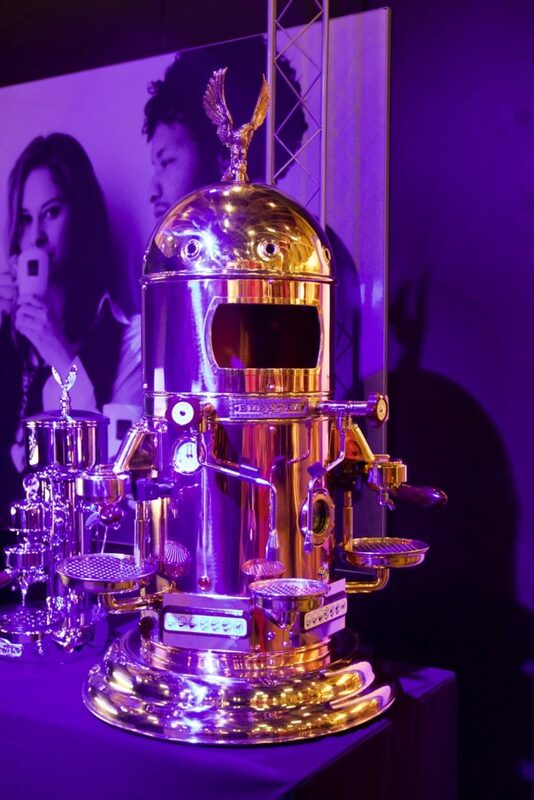 The wooden side panels, paddle and portafilter handle really set it apart from all the chromed machines. There were a few spread around but very few were actively used, much like this one which just sat on a shelf. The ever impressive Elektra Belle Epoque. Over the years the Belle Epoque has had its fair share of updates but it still retains most of its original charm. These Victoria Arduino Mythos 1 grinders were all over the place. The biggest upside to this machine is the almost non-existant dead space, which means the grinder retains almost no coffee at all. This is a large quantity drip coffee brewer called the Hipster (yes really). It’s quite clever actually with an app that allows the user to define different brewing profiles for different coffees. Cakesmith’s came to throw every one off their diet. As good as their cakes look… they taste even better. The grinder on the left is the Mahlkönig Peak, a gravimetric grinder (grind by weight). I wouldn’t be surprised if in the next couple of years this will be the go-to machine for a lot of competitive baristas. This years event was much larger than I anticipated, but also drew in a larger crowd. I met a few great people and reconnected with some old friends. I also saw a lot of new machines and tools and got to try a few of them. The Amsterdam Coffee Festival also hosted the SCAE NL Championships. The Dutch Barista Championship crowned its winner Lex Wenneker, the Dutch Brewers Cup Rob Kerkhof and the Dutch Cuptasting Championship Frans van den Berg. All in all it was a crowded but exciting event, let’s hope for an even better one in 2017!